Why the domestic prices in India moving to higher values? The thretening words of import of one lakh tonnes of natural rubber are not implemented. The tyre manufacturers know that that will lead the International prices higher. Insted of that the purchase and adjustments with bulk manufacturers are going on. If we have to get reasonable price only few dealers are provides it. More than 80% of dealers are controlled by Malayalamanorama with a vyaparivila which is not available on internet. Today’s price was Rs. 128/Kg for better sheets. I sold today by bargaining up to Rs 130/Kg at local market when the prices at Kottayam market was Rs. 140/Kg (which is air dried/dried in sunshine quality sheets equivalent to RSS 1) . It means the benefits are shared within the dealers. Rubber Board don’t know all these things. 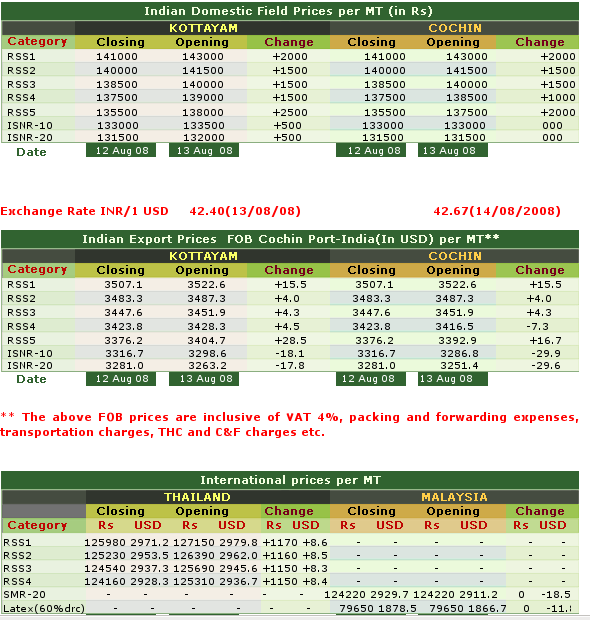 The Rubber Dealers Federation is publishing the prices above RSS 5 only on Internet. The market prices are controlled by the big manufacturer MRF through their printed media with the highest circulation by dealers price. Rubber Board is silent on this matter. Rubber Board publishing only prices for RSS 4, 5, ISNR and Latex 60% drc. The powerfull manufacturer only will get quality raw rubber at reasonable price through agents collected sheets from small dealers. However import is a must for Indian Manufacturers to fullfil the requirement. Because the adjustments in Indian Rubber Statistics can’t provide rubber in the market. The shortage of rubber is seen with dealers shops. The following price increase may be the evidence of import of NR to India.